CNN) – The Church of Jesus Christ of Latter-day Saints has apologized for "a serious breach of protocol" in which the parents of the late Nazi hunter Simon Wiesenthal were posthumously baptized as Mormons. "These submissions were clearly against the policy of the church. We consider this a serious breach of our protocol and we have suspended indefinitely this person’s ability to access our genealogy records." "Such actions make a mockery of the many meetings with the top leadership of the Mormon Church dating back to 1995 that focused on the unwanted and unwarranted posthumous baptisms of Jewish Victims of the Nazi Holocaust." Here’s another wrinkle to this on-going story. On Tuesday, GOP presidential candidate Mitt Romney was called upon by Holocaust survivor and Nobel Prize winner Elie Wiesel to tell his church to stop doing proxy baptisms in the names of dead Jews, particularly Holocaust victims like Wiesel’s parents who were apparently found on a recent Mormon ‘ready to baptize’ list. Response: ‘Baptism of the Dead’ is one of the practices secretly carried out by Mormons in their temples around the world. LDS members routinely search genealogical records for family members and relatives from the past and then submit the names to be baptized posthumously by proxy in temple ceremonies. Mormons believe that in the after life folks are given the opportunity to know and accept the truth. Since baptism is a requirement according to LDS doctrine for the highest glory or kingdom in the afterlife, members of the Mormon Church are baptized in place of their dead relatives in order for them to qualify for the higher glories since it is presumed that most will accept ‘the truth’ (Mormon doctrine and teaching) in the life to come. If you have relatives that are Mormons, chances are that your entire family tree has already been baptized posthumously into the Mormon church. Regardless of the statements made by the church to discontinue baptizing Jews and particularly victims of the holocaust, some believe that the church will merely continue the practice under more controlled and secret conditions. 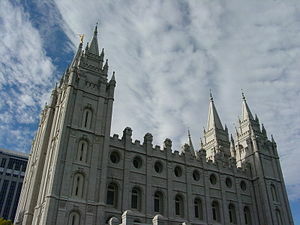 However, the church has made public statements indicating that future violators of the agreement with the Jewish leaders will be disciplined severely by the LDS authorities.